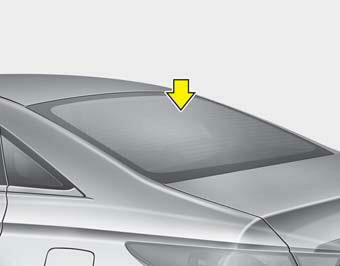 Glass antenna (if equipped) When the radio power switch is turned on while the ignition key is in either the “ON” or “ACC” position, your car will receive both AM and FM broadcast signals through the antenna in the rear window glass. • Do not clean the inside of the rear window glass with a cleaner or scraper to remove foreign deposits as this may cause damage to the antenna elements. • Avoid adding metallic coatings such as Ni, Cd, and so on. These can disturb receiving AM and FM broadcast signals.